Jorunn the Skald-King was a Nordic High King born to Queen Mabjaarn Flame-Hair. The twin brother of Fildgor Strong-Prince, Jorunn grew up believing their elder sister, Nurnhilde, was fated to take the throne, and as such became a singer and did quite a bit of traveling. He showed a rare talent as a singer, highly prized among Nords, and was eventually dubbed the “Skald Prince” of Skyrim. However, his mother and sister were killed in an Akaviri invasion. He led the Nords to victory against the invaders, and took on a new life as High King of Eastern Skyrim. 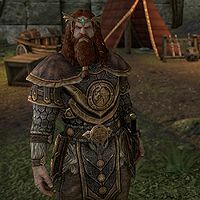 Jorunn studied at Skald's Retreat on the Isle of Gold outside Riften, but he also spent time in Mournhold, Stormhold, Sutch, Elinhir, and is thought to have visited Solitude in disguise. He claimed to have no interest in politics, but still became the unofficial leader of the creative community. Though he received little formal schooling in the arts of arms and warfare, traveling across Tamriel was always a dangerous activity, and he learned how to handle himself. Jorunn was in Riften when the Akaviri of Dir-Kamal assaulted the northeast coast of Skyrim in 2E 572. Jorunn and his closest comrades, the "Pack of Bards", fought their way up the coast to Windhelm, arriving just in time to see its gates breached by the Akaviri. Jorunn hurled himself into the fray, but was unable to prevent the fall of the city and the slaying of his mother and sister, who both went down fighting. Wounded and devastated, Jorunn barely escaped alive. One legend says he decided to appeal to the Greybeards of High Hrothgar for aid, and they summoned Wulfharth the Ash-King to fight at the side of Jorunn the Skald-King. Another account credits Almalexia with summoning the Ash-King. Regardless, Wulfharth and Jorunn rallied the Nords of eastern Skyrim, mustering an army from the Rift and the outer regions of Eastmarch which heavily fortified Riften. Dir-Kamal was convinced to bypass the city and march on Mournhold, assuming that the Nords would be glad to see him go. That choice was a fatal mistake. Jorunn and Wulfharth led their army in pursuit of the Akaviri force, and a Nordic army entered Morrowind for the first time since the Battle of Red Mountain. The Akaviri army was caught in Stonefalls between the Nords and a Dunmer legion led by Almalexia. Aided by the surprise intervention of a phalanx of Argonian shellbacks led by a trio of battlemages, the coalition broke the Akaviri line and drove them into the sea, where they drowned by the thousands. The Ash King, his purpose fulfilled, returned to Sovngarde. In Windhelm, three weeks later, Jorunn was crowned High King in the throne room of the Palace of Kings. Esta página foi modificada pela última vez à(s) 00h48min de 22 de junho de 2015.